This is my second time reading a retelling of Rahab's story and I absolutely loved it! My first "Rahab book" was Pearl in the Sand by Tessa Afshar. Pearl in the Sand featured Rahab as an adult. This Scarlet Cord featured Rahab as a young girl, and then a few years later, a teen. I loved that aspect of this book, getting to watch Rahab grow up. This Scarlet Cord is both a love story and a story of faith. Rahab and her family are Canaanites, a group of people who do not believe in God. They believe in many pagan gods, and participate in rituals to honor them. Acts of prostitution are carried out in sight of everyone at the Canaanite temples, and are in fact considered to be a form of worship. Rahab grows up thinking that all of these things are normal and right. As a young girl, Rahab is kidnapped and her kidnappers plan to sell her as a slave. Sala and his father rescue Rahab as she is running through the streets away from her kidnappers. Sala's father returns Rahab to her family, but in the few days while she waits for her family to come to her, she and Sala become friends. In part two of the book, we find out that both she and Sala never forget each other. Rahab is now young woman, and it is time for her to be married. She wishes she could marry someone like Sala, and not the man her father has chosen for her. Rahab's father takes her into Jericho, in the hopes of finding a wealthy husband for her there, and she happens upon Sala and his father (who are in Jericho as spies for the Israelite army). The friendship between Sala and Rahab is quickly renewed, along with some romantic feelings as well. But there are huge obstacles in the way of their love: first, the fact that Rahab does not believe in God, as Sala does. He knows that his family would never accept his marriage to a Canaanite woman, and her family does not accept Sala's faith either. But the biggest obstacle is that Rahab is selected to participate in a pagan ritual with the king, which involves a marriage reenactment. Rahab despairs at this, while the rest of her family is excited that she has been chosen for such an honor. Sala also despairs, as the marriage reenactment will defile Rahab and further cements her inappropriateness in the eyes of his father. In the midst of all these events, the Israelite army is planning to conquer Jericho. I remember a song from Vacation Bible School that went something like, "Joshua took the battle of Jericho and the walls came tumbling down...," and this song played through my head every time Joshua was mentioned. Joshua and his army plan to storm the city and take Jericho back from the Canaanites. It is the land promised to them by God, and they plan to reclaim it after forty years spent wandering in the desert. The actual event of the invasion was my favorite part of the book. I loved reading about the army and how the indomitable city walls were breached. I loved the way Rahab comes to believe in God. Her faith is absolute once she begins to pray and believe, and I loved that part of the story. In fact, her entire family is affected by her decision. But my favorite part of This Scarlet Cord was the love story. It was so sweet, pure, and well-written. Although I enjoyed reading about the battle of Jericho much more than I thought I would, I loved This Scarlet Cord for the faith and the love story. 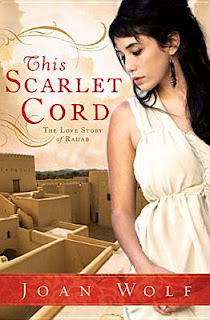 I would recommend This Scarlet Cord to fans of Christian fiction and fans of historical fiction. It is more Biblical than other Christian fiction novels, which I loved. Ooooo cool. I loved Pearl in the Sand. This sounds great.